Just how thin can an Apple iPad get? The new iPad Air sheds an incredible 184g and drops a chassis size. So who called it? Who said that the iPad 5 would weigh less than a bag of sugar, be almost 2mm thinner than any other iPad and be called the iPad Air? Just as the Macbook Air made every other laptop look like a gigantic machine from the 1990s, the iPad Air makes the old iPad 4 look dated. It's undeniably a thing of beauty. But is it worth buying compared to the iPad it replaces? Here's a technology comparison to answer that question. Some of us were expecting an iPad 5 with an iPhone 5S-style fingerprint sensor, a redesigned Home button and another outing for Apple's Touch ID system. Instead, the iPad Air (Wi-Fi + Cellular model) has shed a massive 0.4 lbs, reducing the weight of the popular 9.7-inch tablet to just 1 lb to be exact. It's an unbelievable drop. The iPad 4 is hardly a fat or weighty slate. But its 1.4 lb frame suddenly seems disappointingly heavy. There are other subtle design differences, too. The iPad Air measures 240 x 169.5 x 7.5mm compared to the 241.2 x 185.7 x 9.4mm iPad 4. 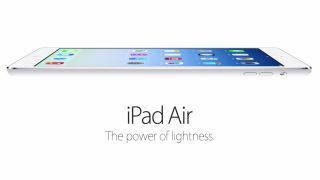 Using Apple's own stats, the new iPad Air is "28% lighter, 20% thinner [and] 24% less volume." The iPad Air also features dual microphones on the bottom edge to capture clearer sound and reduce background noise during FaceTime calls. Considering the big changes elsewhere, there was little chance that the iPad Air's 9.7-inch Retina display would get an upgrade. With a resolution of 1536 x 2048 pixels and a pixel density of 264 pixels per inch (PPI), the current Retina panel still offers superb clarity. The Air's big selling point is its skinny frame - the clue's in the name. Like the iPad 4 before it, the iPad Air incorporates a range of image capturing cleverness. The core 5 Megapixel, five-element lens is essentially the same technology. It has the same f/2.4 wide-angle aperture and the same Backside Illumination Sensor (BIS). This captures more light to give you better results when snapping shots in dim lighting conditions. Other options include autofocus and tap to focus, tap to control the exposure, face detection, HDR and a Hybrid IR filter. The filter helps reduce the effects of infrared light, which can adversely affect image clarity. As far as video is concerned, the rear camera can capture 1080p video, while the BIS-enhanced 1.2MP front camera can record 720p footage. Like the iPad 4 before it, the iPad Air is a go-anywhere device that is available in Wi-Fi only and Wi-Fi + Cellular models. The latter embraces 3G/HSDPA, CDMA and LTE connectivity. Both iPads also include Bluetooth 4.0 and 802.11a/b/g/n Wi-Fi, although the new Air benefits from added MIMO (Multiple Input Multiple Output) technology to boost connectivity speeds. The iPad 4 is based around a dual core A6X with a quad-core graphics chip. But like the iPhone 5S, the iPad Air has been built around Apple's new 64-bit A7 chip. Even though this is reportedly a dual-core CPU running at 1.3GHz, benchmarks have pegged its performance above quad-core phones like the LG G2 and the Samsung Galaxy S4. If that wasn't enough, the A7 chip also beats the A6X thanks to the presence of Apple's new M7 motion coprocessor, which monitors any movement data gathered from the iPad's built-in accelerometer, gyroscope and digital compass. Future location and fitness apps are poised to become scarily precise. No real change here. The older iPad 4 offered four storage options - 16, 32, 64 or 128GB. The iPad Air follows suit, putting bigger and deeper dents in your wallet if you crave more storage space for apps, videos, music and photos. Despite the reduced size of the iPad Air and the power demands of the speedy A7 processor, Apple has retained the same 10 hours of Wi-Fi using, video-watching, music-listening battery life (or nine hours of web browsing) as the iPad 4. The iPad Air improves on the old iPad 4 where it matters most. First, it uses the A7 chip from the iPhone 5S to get an extra turn of speed. You'll notice it when you open processor intensive apps such as iMovie or Infinity Blade III. The new 64-bit architecture positions the iPad line for the future, while the high resolution Retina display continues to impress. But nothing is as impressive as the freshly machined, surprisingly skinny design. Which begs the question: what's Apple going to do with the iPad 6. Or should that be the iPad Air 2? Here's what we think of the iPad Air so far.